Downtown as viewed to the west from Leaf Links in GTA Vice City. 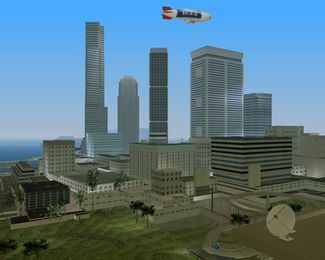 The east side of the district is dominated by towering skyscrapers that are prominently visible from northern Vice City Beach. 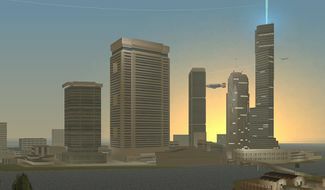 Downtown, Vice City, as viewed to the southeast in GTA Vice City. Downtown is the business sector of Vice City in Grand Theft Auto: Vice City and Grand Theft Auto: Vice City Stories. It is bordered by Little Haiti to the south and a body of water elsewhere. 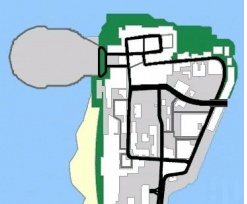 Map of Downtown in Grand Theft Auto: Vice City. Downtown is the northernmost area in the city. Mirroring Downtown Miami, it has most of the city's skyscrapers, including the tallest structure in the city. The giant Hyman Memorial Stadium hosts events such as concerts, stock car races, demolition derbies and dirt bike stunt shows. Downtown is the location for the local heavy metal radio station V-Rock and an enclosed recording studio, where lead singer for rock band Love Fist, Jezz Torrent, was seen recording a song. The Ammu-Nation gun store supplies weapons and armor. Other places of interest include the Vice City News (VCN) headquarters and a venue for a Love Fist concert, just south of the V-Rock radio station. An unnamed beach is also located west of Downtown, but it receives no visitors or attention, a stark contrast to Washington Beach in the Ocean Beach area. A police station, hospital and one of the city's fire station is situated in the area. Like many parts of the city, Downtown has seen major changes between 1984 in GTA Vice City Stories and 1986 in GTA Vice City. The dirt track in the north has changed dramatically. The giant The Mendez Building directly west of Hyman Condo has been torn down and replaced with a shorter building. By 1986, a giant GASH blimp circles endlessly around the city. Ammu-Nation added a giant shooting range to its store. In 1984, the area is dominated by the Bikers gang led by Mitch Baker. By 1986, the gang has lost control of the area. While the Bikers remain at The Greasy Chopper, they don't control much territory and the rest of the area is not controlled by any gang. Tommy Vercetti visits Kent Paul in the V-Rock recording studio in order to help out the Love Fist metal band. His job include buying some drugs and delivering some company for Love Fist during "Love Juice", deal with a psycho who has been harassing the band during "Psycho Killer", and drive them to their concert during "Publicity Tour". Kent Paul wants security from the Biker gang so Vercetti helps out by persuading the gang's leader, Mitch Baker, to provide security. In order to win Baker's trust, Vercetti has to race around Downtown with other Bikers during "Alloy Wheels of Steel", cause havoc during "Messing with the Man", and retrieve Baker's bike during "Hog Tied". Vercetti bought a couple of properties in Downtown: Hyman Condo and Skumole Shack. He took part in major events in Hyman Memorial Stadium and was shooter of the month after successfully completing the rifle range in Ammu-Nation. Uzi - Found underneath the staircase leading to the Skumole Shack. Molotov Cocktail - Found underneath the Tacopalypse canopy. M60 Rampage: Located in the northernmost corner of the Moist Palms Hotel. Flamethrower Rampage: Located next to a staircase leading to a helipad on the north side of the Hyman Memorial Stadium. Molotov Rampage: Located at the top of a staircase of a building near the VCN building. Minigun Rampage: Located in front of a door on the ground floor of the VAJ Finance building. This page was last modified on 20 October 2011, at 09:41.